Small batch moist pumpkin cupcakes topped off with brown sugar meringue frosting. A perfect Fall dessert! It’s that time again to dig out the snow gear and see what fits, or doesn’t and what’s missing. Anyone in colder climates will totally understand this. If you wait until the last minute, or until snow gear is actually needed, you’re pretty much out of luck. You have to plan in advance. The same goes for summer gear honestly, but you can find flip flops and swimsuits year round and the prices typically don’t go from reasonable to ridiculous. That’s not the case with winter gear. Plan early and you can get gear at normal prices. Wait and you pay price for not planning ahead. I pulled out everything I could find and had the kids try it all on. Seems silly to do when it’s nearly 70 degrees out, but it’s necessary. Only one pair of snow pants is missing… that we’re sure to find next Spring or at least after I’ve bought a new pair and they’ve been worn. It’s always the way. Of course I kept being drawn to all of the cute scarves while doing winter gear browsing online…not that I need any more scarves! You can only wear one at a time, but options are always good! Or at least that’s what I like to tell myself. Monday’s can be rough enough, so I figured let’s kick off the week with something extra special and sweet. I’d dreamt up this cupcake ages ago and finally had the time to test it out. They turned out spectacular. If you love pumpkin goodies, you have to make these pumpkin cupcakes! 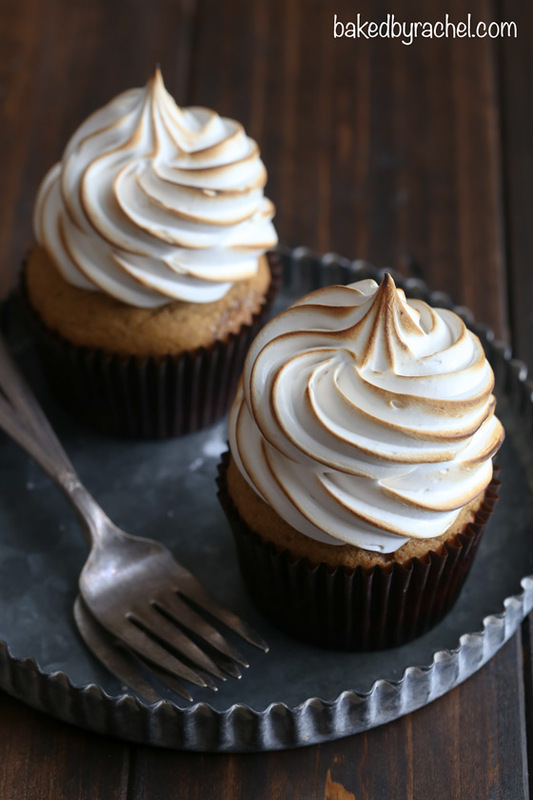 Perfectly moist pumpkin cupcakes topped off with airy brown sugar meringue frosting. A light toasting gives these cupcakes the perfect finishing touch! An absolute must make Fall dessert! 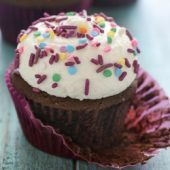 Bonus…this recipe makes just eight cupcakes, so you won’t have a ton taunting you each time you walk through the kitchen! 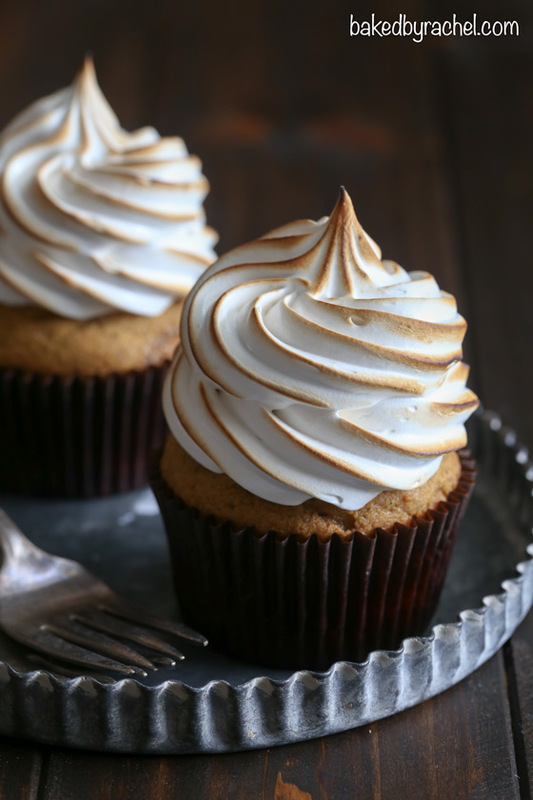 Add these pumpkin cupcakes with meringue frosting to your Fall baking plans! You won’t regret it! In a large bowl or stand mixer, cream together butter and sugars until light and fluffy. Beat in eggs and vanilla. Scrape bowl as needed. Mix in baking powder, baking soda, salt and spices. Mix in flour and pumpkin in alternating batches until fully incorporated and no streaks remain. Divide batter between prepared liners using a large cookie scoop. Bake for 20-22 minutes or until a toothpick inserted comes out clean. Cool in pan for 2 minutes before transferring to a wire rack to cool completely. Add egg whites, brown sugar and cream of tartar to a metal stand mixer or mixing bowl. Place over simmering water. Whisk mixture until sugar dissolves and egg whites are frothy and warm to the touch. Place mixing bowl in stand mixer, beat with whisk attatchment until stiff peaks form. Whisk in vanilla during the last 30 seconds. Transfer mixture to a large piping bag fit with a piping tip. Pipe meringue frosting on cooled cupcakes. Lightly char frosting using a kitchen torch. You are SERIOUSLY the cupcake QUEEN! I wish you were my neighbour so you could just ship them all over to me. I mean these would definitely make waking up at 4am on a Monday better – pinned! Can this recipe be doubled to yield a higher count?? Absolutely! The recipe can easily be increased for a larger batch. I hope you enjoy them, Marie! That meringue looks so perfect! That toasted meringue frosting looks like absolute perfection! I could easily eat a couple of these delicious cupcakes right now! Should the vanilla extract be 3/4 tsp? 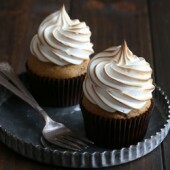 I love meringue on pies so I’m thinking these cupcakes need to be in my face right this MOMENT!! So, so pretty! You’d love these cupcakes then ;) And thank you! Darling, just darling!! And I love/hate that time of year to see what fits and what doesn’t – for the kids or for the adults – but mine isn’t because I’m a growing kid, it’s because I had too many treats! But these cupcakes, I wouldn’t be able to turn down! Wow. Thanks so very much for brightening my Monday :) These look absolutely amazing! I’m going to dream about that frosting tonight! I must try these! Cupcakes make any day better! These especially look glorious, with all that meringue frosting–yum! Brown sugar meringue?!?! 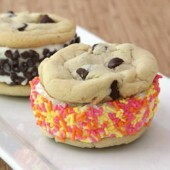 Oh my goodness, need to make these! Flip flops year round would be amazing! These are so pretty! 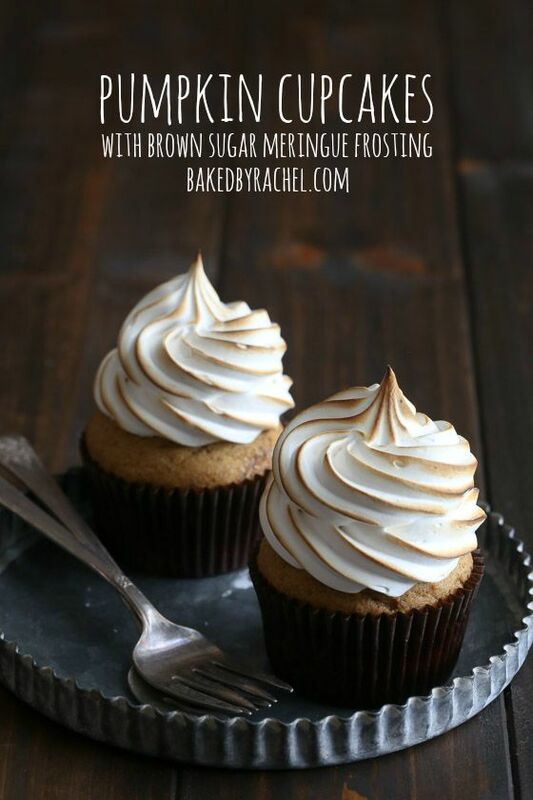 I love meringue frosting and it sounds so delicious on top of these cupcakes! I still need to dig out everyone’s winter clothes myself! I have been putting it off since it is still so warm and it can be quite the job! Thanks Malinda! I totally would have held off longer too if I could have! These are such gorgeous cupcakes, love that meringue frosting! Hi, these look delicious! 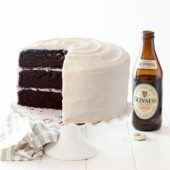 I have a question: can you add color to this frosting? My friend wants me to make these BUT with green frosting. (Themed birthday party). You should be able to color it without any problems. Be sure to use gel food coloring, not liquid food coloring, and add it in at the end of the whipping cycle. Remember that a little big of gel color goes a long way! Good luck!